© 2016 Bibliotrek. All rights reserved. For me, making a piece of art is like writing. Before anything else, I ask myself what it is going to be about. In this instance, I knew I wanted it tied to the season of spring. 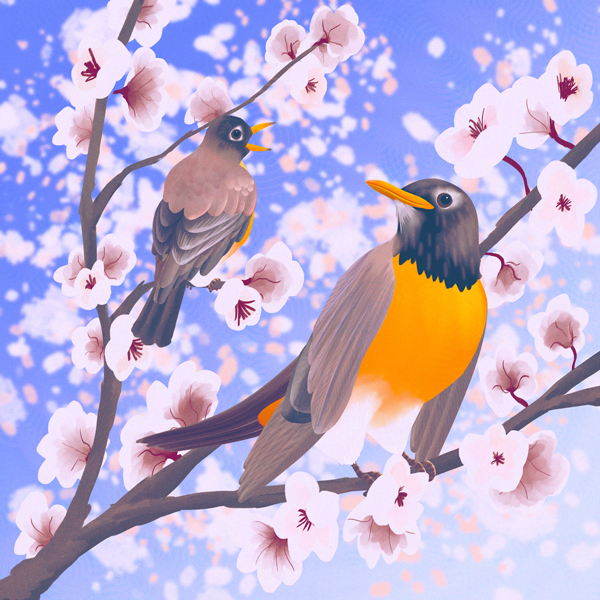 A recent conversation with a cousin involved my grandmother and spring robins. So I also wanted robins involved. I have memories of visiting my grandparents on the farm. In spring, the crabapple trees were lush with pink blossoms. Too soon did the pink petals fall from the trees. But during that brief window of time, the blossoms filled blue skies like fairies dancing on the wind. I started to see my composition. Next week, I’ll talk about the actual process involved in making this piece. We’re going to do a little jump again – Partially because I need to focus my thoughts in preparation for the first of many conventions this summer. So here we go! CONVENTIONS AS AN ARTIST: WHAT SHOULD YOU KNOW? SHOULD YOU KNOW THINGS? LET’S FIND OUT! 3 TIPS FOR ATTENDING ARTIST ALLEY 1. GET THERE EARLY I recommend arriving at the convention AT LEAST an hour before the doors open. I can’t tell you how many times I arrive at my table, only to discover my table placement will require a…unique…setup solution to garner aisle traffic. It is also nice to have a little quiet time before the doors open to collect your thoughts and mentally prep for the attendees. 2. AIM YOUR TABLE TOWARDS TRAFFIC Since aisle traffic can flow both ways, I recommend setting your table up like a sound shell, with a major inward facing wall directed at the heaviest flow of traffic, and a minor inward facing wall pointed towards the lighter flow of traffic. Not sure where the heaviest flow of traffic will be? Look to where attendees will be arriving from. Are you at a coveted corner table? Maybe two outward facing walls would be best for you. Wherever you are, be aware of your surroundings and be creative. 3. TAKE INVENTORY OF YOUR WORK You may think you know what pieces are selling well based on customer feedback, but if you keep track of numbers, you could be surprised. Sometimes a less hyped piece will outsell pieces with more hype. A piece featuring a trending pop culture character may draw people in, but that doesn’t mean it will sell well amidst a sea of similar pieces by other artists. Alternatively, a quiet piece featuring a sleeping cat may not draw as many people in, but that doesn’t mean it won’t sell well. And those are my three tips for today. I may or may not have set aside 9 or 12 additional tips to share later in the summer. Hopefully, they prove useful to someone. TUTORIAL TUESDAY – COMPOSITION, PT 1. TUTORIAL TUESDAY – COLOR, PT 2. USING YOUR PALETTE Since the interruption from the previous post has been taken care of, let’s talk about how to use your palette, shall we? One of the biggest mistakes I made early on was trying to work directly in color. I “knew” an apple is red, so if I’m painting an apple, I just need to paint red, right? You could, I guess. But there is a better way. What would you say if I told you the best way to paint with color is to not use color at all? The little owl is right, old-timer with the mustache that literally got out of control when I was drawing it. You need to start opening your mind to new ideas, because by starting with something like this: …I’m able to control all the light and shading before even touching color. And because I already have the only colors I can use, I can focus on utilizing those colors to come up with this: So how did I get from Kansas to Oz so quickly? Let me break it down for you, step by step. STEP 1 – DRAW THE SUBJECT IN B&W. As mentioned before, by keeping the object grayscale, I’m able to focus more on how light and shadow play with the object. STEP 2 – CHOOSE YOUR COLORS. Well, half the work for this step is already done, as we took the time in the previous lesson to create a unified palette, right? So now, we just pick out the colors we know are found in an apple. As I’m sure you know, nothing in your observable field of view is purely one color. Even the blackened screen of your TV reflects various shades of the yellow light bouncing around your room from time to time. So we can’t just limit ourselves to reds. Below I have a gradient bar identifying the six main colors I used in the apple (excluding the brown and green from the stem and leaf.) [caption id="attachment_541" align="aligncenter" width="406"] (FROM LEFT TO RIGHT: BURGER BROWN, GOOD BURGER MAROON, SALMONELLA RED, PRESIDENTIAL BRONZER, PASTEL YELLOW, AND THE LAST ONE. )[/caption] Speaking of gradient bar, I should probably pull back the curtain for a moment, which leads us to… STEP 3 – GRADIENT MAPS AND YOU. Now that you have your B&W drawing, as well as the colors of the apple (Excluding leaf and stem), open up a gradient map in Photoshop (Layers>New Adjustment Layer>Gradient Map) and plop your chosen colors into the gradient editor (seen below). Once you have the colors in place and adjusted accordingly, your B&W apple should look like this: STEP 4 – TWEAK TWEAK TWEAK! As you see, the gradient map colors EVERYTHING. How do you fix that? With vector masks! Applying a vector mask to the gradient map layer will allow you to block out areas you don’t want the gradient map to affect by painting the area black. Notice how the stem and leaf are grayish again, while the light violet has been removed from the background. STEP 5 – FINISHING TOUCHES Selecting a green and a light brown, paint on a layer over the leaf and stem, and then set the layer’s blending mode to “Overlay.” And presto! Like magic, the once B&W apple is in stunning technicolor! [caption id="attachment_535" align="aligncenter" width="300"] Before[/caption] [caption id="attachment_536" align="aligncenter" width="300"] After[/caption] This, of course, is only one way to use color in your paintings. As you advance, you’ll probably be able to see the value in every color and paint without a B&W place-holder to begin with. Also, we didn’t touch AT ALL upon color theory, or using color to guide the eye through a composition, or a lot of other things important to color... Uff-da. I think I have a few more color posts in my future. Oh well. Until then, feel free to follow me on Twitter, Facebook, Instagram, and/or Tumblr! TUTORIAL TUESDAY – COLOR, PT 1. CREATING A PALETTE Working on a digital canvas means one has access to a near unlimited range of color. Though this seems like it should be freeing, it’s the opposite. A blank sheet of paper can leave a writer paralyzed, searching for the perfect word. A blank canvas can leave an artist paralyzed, trying to find the “right” color. But creativity thrives under constraint. This is why I use a palette. Using the same few colors in every piece creates a visual unity across pieces. Also, a limited selection of color can act like a metaphor by alluding to colors that aren't even present. A master can convey the entire spectrum of color with only a handful of swatches. I am not a master, but I have been using the same palette of only 40-some colors for years now. And what I want to do in this first part of a two-part color tutorial is show you how to create your own palette for use. Above are the only colors I use in any single piece. The first iteration of this palette was created while working in sprite animation. Since then, I’ve made a few tweaks and adjustments to create the palette you see. Though useful in spriting, it may not be the most useful in digital painting. So let me show you how I made the palette to begin with, and then you can choose to link it up like this on your own if you like. STEP 1 – CHOOSE YOUR PRIMARIES. Growing up, many of us learned that the primary colors are red, yellow, and blue. Except when they are red, yellow, and green. Or cyan, magenta, yellow, and black. So really, it is up to you what colors you want to use as your primaries. For me, I’ll start with good ol’ RYB! STEP 2 – CHOOSE YOUR SECONDARIES. This step is a little clearer than the previous, as the secondary colors are the half-way point between each of the primaries. Of course, you can feel free to tweak your secondary colors as you see fit. Halfway between my red and blue was really brown instead of purple, so I adjusted some numbers until I got what I wanted. STEP 3 – HEREEEEEEE COME THE TERTIARIES! Tertiary colors are the ones between your primary and secondary colors. Of course, by this point, I want to start introducing shades and tints into the palette, so I’ve invited my friends, Shades McShady and Tintletoes the Grayish Deer! STEP 4 – MORE? Umm…guys…. STEP 5 – RUN. STEP 6 – UH OH. BETTER AVERT YOUR EYES. STEP 7 - [REDACTED] STEP 8 – WHATEVER YOU DO, DON’T TELL HIM I WAS HERE. Ahh…who am I kidding. I’ll have to clean this up sooner than later. I’ll be back in a few hours. While you wait, why not try hiding under your desk and dreaming of gray skies. You know, for safety! When making a piece, this is the step most people usually jump to directly, myself included. However, it is important to know that concept and composition are very important steps that shouldn’t be skipped. That said, when it comes to drawing or painting, it is a simple two-step process: 1) Sketch ideas until a viable concept appears. 2) Build the drawing/painting on top of that foundation. If you wanted to add a third step, it could be... 3) Repeat Step 2 as needed. ...but then we expose the secret for getting better at anything: PRACTICE. In all seriousness, there are more than a few technical aspects involved in the production of a digital painting (SEE MASTER POST). But for those looking for the TL;DR, check out this video. It contains a fast and dirty example of all the technical aspects coming together. For a little more complexity to the issue, here are some of the thoughts that go through my mind while I’m working. When I’m planning the composition, I’m thinking like an illustrator. When I’m painting, I thinking like a sculptor. I try to envision the objects in the piece as three-dimensional. To do this, I ask myself the following questions: What shape is every individual object when broken down? Sphere? Cone? An amorphous rhomboid blob? How do these shapes interact with each other? Where is the major light source coming from? Where is the minor light source coming from? How intense are the light sources? How do they interact with the primary shapes? While I ponder these questions, I start setting up the document I’ll be working from. Generally, I’ll start with three layers: Foreground, Midground, Background. The Background is where the concept sketch often gets placed. It remains in sight until all objects in the Foreground and Midground are in place. The concept sketch is then hidden. In its place is a horizon, forest, back wall; whatever setting best fits the image. The Foreground is the objects in the piece that are closest to the viewer. Sometimes this could be objects meant to aid in framing the composition. Sometimes it may be the primary object of the piece. The Midground is everything else that doesn’t land in the Background or Foreground. This could be anything from secondary objects to certain weather conditions. For the most part, a lot of this is in black and white, with color applied to the objects in a later step. Additionally, I spend some time smudging and blurring all the basic shapes as needed. But both of those steps are for future posts. If you have any questions, feel free to ask me directly on either Twitter (@markericelton) or Facebook (@MarkEltonArtist). And to see more “works-in-progress” as they happen, follow me on Instagram or Tumblr! For me, making a piece of art is like writing. Before anything else, I ask myself what it is going to be about. In this instance, I knew I wanted it tied to the season of spring. A recent conversation with a cousin involved my grandmother and spring robins. So I also wanted robins involved. I have memories of visiting my grandparents on the farm. In spring, the crabapple trees were lush with pink blossoms. Too soon did the pink petals fall from the trees. But during that brief window of time, the blossoms filled blue skies like fairies dancing on the wind. Pink blossoms. Blue skies. Robin Red-Breast. I started to see my composition. Next week, I'll talk about the actual process involved in making this piece. This movie was all form and absolutely no function. I restarted from the middle because I had no idea what was happening. Even after reading the IMDB plot synopsis, I still had no idea what was going on. The only thing it really had going for it were interesting visuals. I had seen this once before, and apparently fell asleep, because I didn't remember there being a physical antagonist. My original memory of this film made it out to be a subterranean "Lord of the Flies", which I think would have been more interesting. I'm not entirely sure why this movie is called "Friday the 13th." Did everything occur on that day? Couldn't it have occurred on any other day? I mean, it was about a mother seeking revenge on counselors that had nothing to do with her son's death at a camp that has been closed since the original incident. There was no hint of superstition from what I recall. The fact that this became a franchise is...surprising. Film students get lost in the woods and yell at each other. Back in elementary school, I checked a book out from the library that was filled with movie monsters. In addition to classics, like Dracula, the Mummy, and Frankenstein's Monster, it also had sections about the Gremlins, Freddy Krueger, and Pinhead. I've never been completely certain what the deal with Pinhead was, but after watching this movie, I will admit that it has one of the more interesting concepts: Frank the Monster, a violent sadomasochist human, acquires a puzzle box that summons extra-dimensional travelers (the Cenobites) that capture him and imprison him in a hellish torture dimension for eternity. Frank decides he has had enough of the torture and tries to return to our world with the help of his mistress. Unfortunately, multiple blood sacrifices are needed to restore Frank to this dimension. The main weakness of this film is that there are two seemingly separate antagonists: Frank and the Cenobites. I feel it would have been a stronger film if one or the other had been dropped. Regardless, I did find the idea of the puzzle box and Cenobites interesting. Definitely the most violent/gory film on this list; so much so that it would make even Eli Roth a little nauseated. I've seen horror anthology films before, like V/H/S or The ABC's of Death, but I can't say I'd ever seen a full-length feature anthology film centered around Halloween. The prime-time version of Poltergeist. Originally, I thought this would just be a foreign, locked-room zombie film. Stuck around to the end. Was pleasantly surprised. This was an interesting idea, performed adequately. Before I had ever seen "Army of Darkness" or "Evil Dead 2", I saw "Evil Dead." That movie was okay. Then I saw "Evil Dead 2". Which...confused me. Aren't they basically the same film? Except, ED2 was done for laughs, right? Maybe not purely for laughs, but it didn't take itself as seriously as the first. It did act as a perfect bridge between ED and AoD, however. Anyways...watch all three films. Much like the arc of Raimi's Spider-Man trilogy did years ago, it starts off serious and ends absolutely absurd. Visually, this was unlike anything horror movie I had seen before. This also signals the first film on the list that I would watch again. Interesting film, but really more thriller than horror. The poster is much creepier than the film itself. Another Raimi film on the list. In terms of horror...it really felt hopeless. Had I made the film, I don't think I could have pulled the trigger that determined the final moments of the film. I worked at the Fargo Theatre as a projectionist when this film first came out. As such, I listened in on this movie multiple times a night for the duration of the theatrical run. This was the first time I actually watched the film. Lives up to everything I heard. Apparently, there was a time in the 80's when legitimate horror was deemed appropriate for children. The first time I saw "The Thing" (as well as "Poltergeist," for that matter), I was spending most of my nights and weekends making props and decorations for one of the epic Halloween parties my friends used to host. As such, I have fond memories associated with this film. After having watched it again, I can say I enjoy this film even more than before. There is something to be said about being too afraid to fall asleep. Been there, done that. Being too afraid to fall asleep not because you're vulnerable, but because there is something in the dream world waiting for you? Terrifying. Believe it or not, this film is based on real events. Another film based on real events. It's "Vera" good. Some people consider this one of the scariest movies ever made. I don't know if I would go that far. It is pretty fascinating, and I feel like I may come back to this film at a later date, as I noticed some things in passing that I haven't really mentioned about the film. I'm usually not a fan of slasher films, but this one is actually a bit more than just a generic slasher. In fact, as good as "Halloween" is, I think this film is actually better. From the opening moments of the film, you can already the feel discomfort from the dry, bug-filled heat. Follow that with the foreboding creepy hitchhiker and the altogether disconcerting desolation of the area they are traveling through, and escape from the redneck cannibals feels genuinely hopeless. The film places pressure on your fear instincts all the way until the end. When I first saw this film in high school, I really didn't think much about it. Watching it again years later, and I can appreciate just how smart the film really is. Jeff Goldblum really owns this film from the start. Whereas many actors have to work to pull off the geeky/nerdy scientist, Goldblum comes to it naturally. This becomes even more impressive later in the film when he starts oozing confidence and transitioning into a jittery, sugar-fueled mania resembling that of a methamphetamine user. And though Geena Davis really holds her own at the beginning, I do feel a little disappointed in how her character seemingly folds after having displayed a fierce independence at the beginning of the film. I always knew this film was a cult classic. I just never knew why. Despite how some people may criticize the the cheesy production utilized throughout the film, it was the final moments of the film that made it all worthwhile to me; transforming "Re-Animator" from cheesy fun to a film willing to step forward and take the road less traveled by actively avoiding the happy ending through the wholly believable actions of the main character. Many other people have said many good things about this film already. So all I'll say is this: I'm glad it exists. Years later, and this film holds up surprisingly well. I've always had a special place in my heart for werewolves. This film is, in my opinion, the best film I have seen featuring werewolves. Just thinking about the film, and I can clearly hear "Moondance" in my head. In regards to a horror movie marathon, this film works very well as an epilogue, and as such, was the last film I watched. Though it may not be the best horror film, it is definitely one of my favorites. This film was discomforting on many levels, and was absolutely terrifying on most of them. Furthermore, the lesson I took from the end of the film is one I'm surprised I hadn't seen in any other horror film previously. Gothic horror in a modern setting that will leave you unsettled throughout the entirety of the film and looking over your shoulder long afterwards. Everyone who told me about this movie described it as a Swedish vampire film. Despite that totally accurate description, it did not prepare me for the actual monster in the film. Though all three of the top films on this list lingered in my mind long after, this is the only one that completely flipped my expectations.